If you have read my recent two posts, you will know that I recently visited the ICEHOTEL and ICEBAR in Sweden. After this, we headed North to Abisko National Park with a view to catching a glimpse of the evasive Northern Lights. We were lucky enough to do just this (see my next post). Abisko National Park is one of the best places in the world to see the Northern Lights. It is a 77 km² national park in Swedish Lapland famous for its natural beauty, Nordic wildlife and is a hot (cold) spot for winter adventures as well as summer hiking in the midnight sun. We stayed at Abisko Mountain Station, a classic lodge situated in the most Northern part of Swedish Lapland – 250 km north of the Arctic Circle. It sits at the foot of the Mountain where the Aurora Sky Station is situated, and offers breathtaking panoramic vistas over the national park. 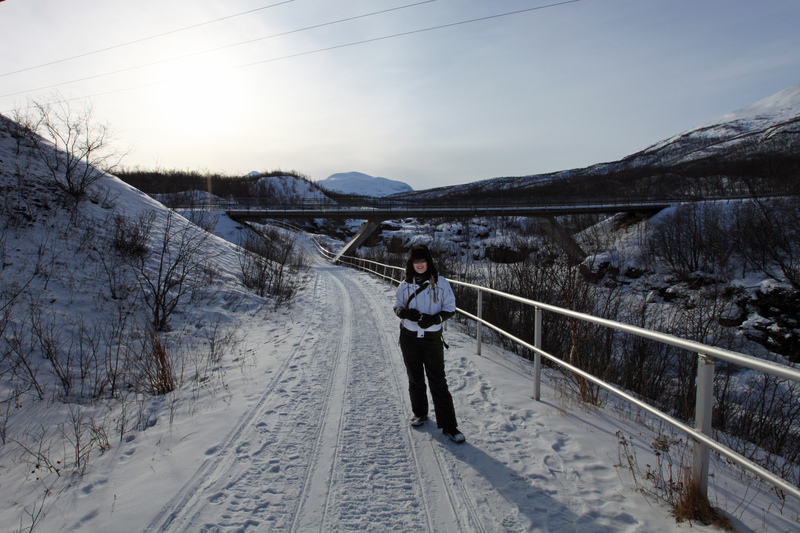 Abisko is the start of Sweden’s best known skiing and hiking route – the 440 km long the King’s Trail (Kungsleden). This location meant that we really did get to see some of the best of Sweden’s Winter beauty and nature. On our first day there it snowed and due to the very rural location, there was really nothing to do. The weather was too rubbish to see or do much, there were no buses, taxis or shops near by, and the wifi signal was almost non existent unless you sat in exactly the right position in the guest lounge. It was the worst start to our Abisko trip. 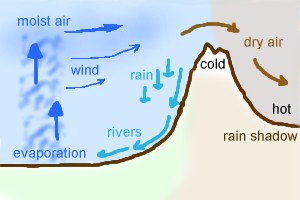 The forecast was for continued rain over the coming days, but thankfully Abisko is situated in a ‘rain shaddow’ which basically means that its location in the mountains mean that it gets less rain than surrounding areas, often defying poor weather forecasts. On our first night, due to a lack of public transport (trains only) and a desire to eat at The Abisko Mountain Lodge a couple of miles away, our only choice was to walk there. It was well worth the walk though; the food was beautiful and we stumbled upon a fantastic location to snap pictures of The Northern Lights. The food was wonderful too. We ate a Walnut and Goats cheese Salad followed by a Moose and Reindeer patty; good Swedish food. The restaurant was much cosier than the one in the Mountain station too. The bill was less welcome. Sweden is massively expensive, and the bill came to almost £120 for two of us to enjoy a two course meal and a couple of alcoholic beverages, and this was pitched as hostel accommodation! The next morning, we woke to brilliant sunshine! We ate our breakfast, threw on our ski suits and went hiking. The scenery was just incredible… The air was so crisp and fresh, and the scenery was just beautiful. Four hours literally melted away as we hiked through the mountainous area, gazed upon an enormous frozen lake, canyons and fjords, waterfalls that were frozen in motion so that they looked like nature had ‘paused’ them for the winter. It was just amazing to absorb Sweden’s natural beauty at it’s Arctic best under blue skies, with its lazy low-laying winter sunshine reflected from every snow covered expanse like a sea of tiny sparkly diamonds. We didn’t feel cold at all in the sunshine and there was a peaceful, still air. It was really lovely to explore the park together and recharge our batteries by sharing some much-deserved quality time together as a couple-a bit of a rare treat as any parent of young children will appreciate! After lunch, we went to bed to get some sleep in excited anticipation of standing under clear start nights sky of aurora gazing up at the Aurora from the Sky Station up at the top of mountain… We woke in the late afternoon to gale force winds, and a snow storm unfortunately… My next post will discuss our ‘not quite to plan’ Northern Lights experience. Unlike other Lapland resorts we visited in Finland and Sweden, this resort didn’t have full hire of arctic suits included in your lodge booking (though it is included in any visits up to the Aurora Sky Station). They were available to hire at additional cost. Same applies to snow boots. There are no buses or taxis available in Abisko. The nearest taxi company is in Kiruna (over an hour away). 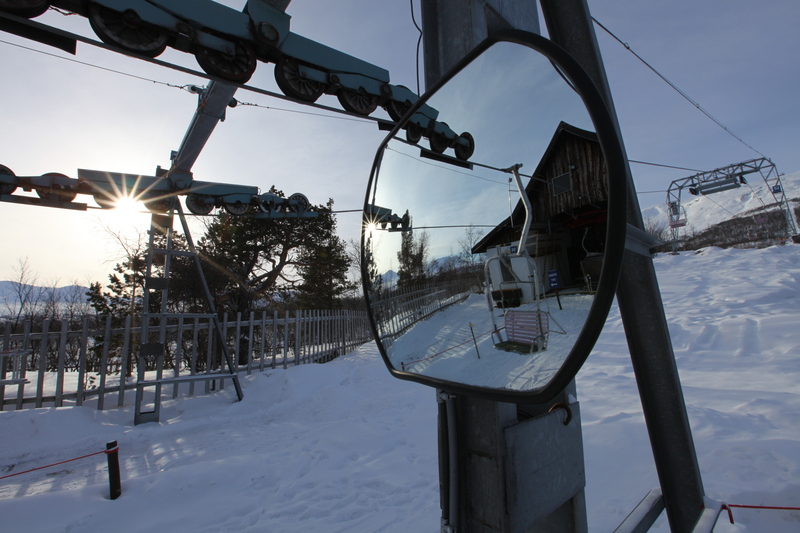 The only public transport is the train line (which stops right outside Abisko Turiststation. Ensure you take your camera/phone charger with you, as batteries drain REALLY quickly in arctic temperatures. Take hand warmers to insert into your gloves at night or during very cold activities like husky sledding.